I stopped in at Harling Point - known also as the Chinese Cemetary - and scanned out to sea for a while this evening. 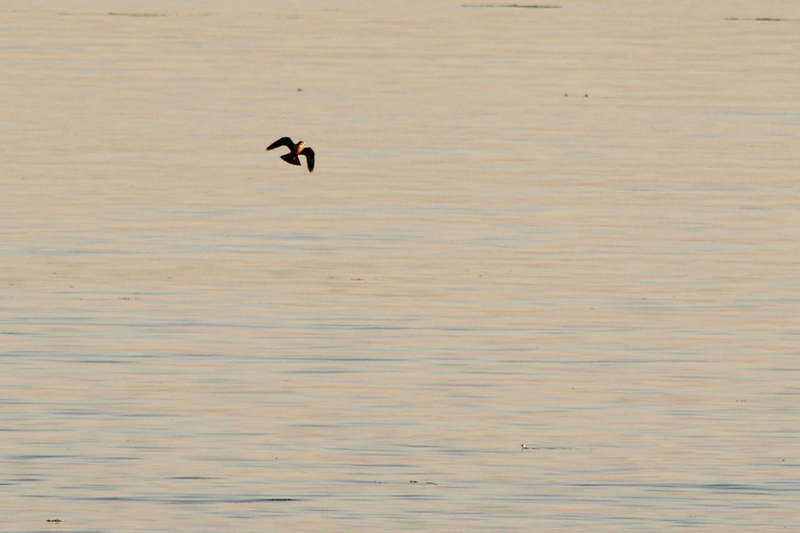 In the last couple weeks, it has been quite easy to spot Red-necked Phalaropes bobbing along the tide rips. This evening was no exception. In fact, one group was close enough that I was alerted to them by hearing a couple call notes as they lifted off the water and flew off to the east. One straggler phalarope met with a very unfortunate end in what was one of the most amazing sightings I've had in a while. I always think that you will witness some incredible events if you set yourself up in an area with lots of activity and just observe. When I took a break from scanning through the scope, I noticed a very fast-flying dark bird over the water and realized it was a Peregrine Falcon in full hunting mode. 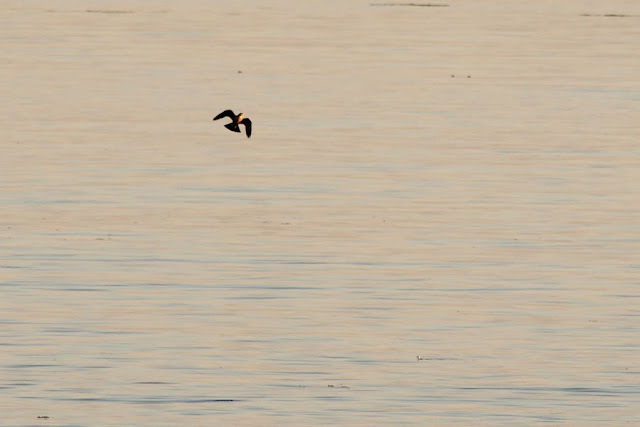 The object of his interest was the lone Red-necked Phalarope. 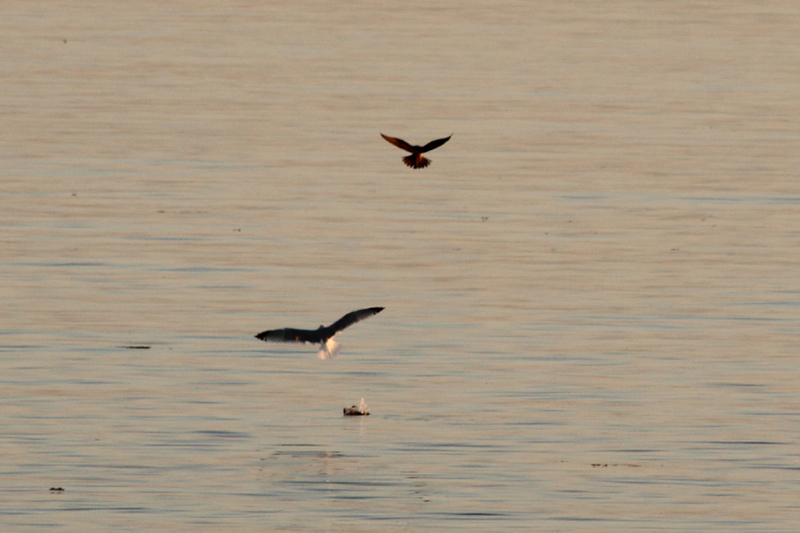 The initial attempt was easily dodged by the phalarope as it made a quick turn as the falcon rapidly approached. The falcon was undeterred and doubled back, gained some height, and then dove to gain speed again. 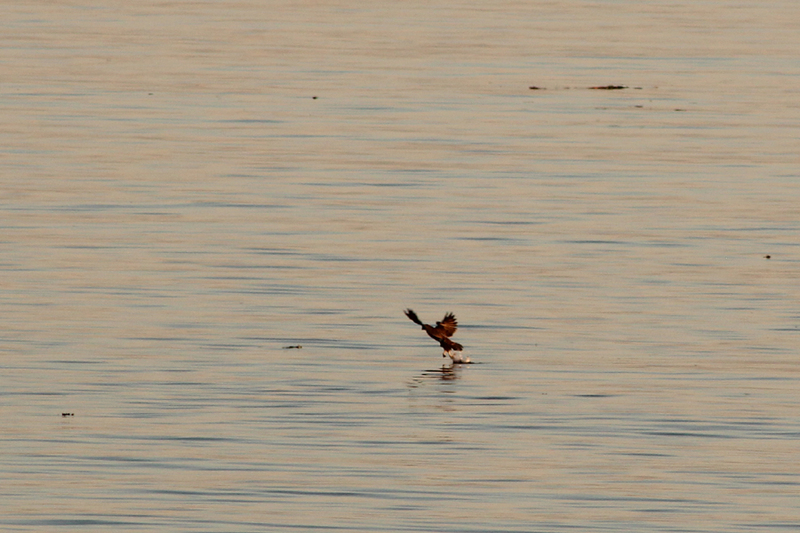 The falcon broke into some powerful wing beats and was quickly back on the trail of the phalarope. 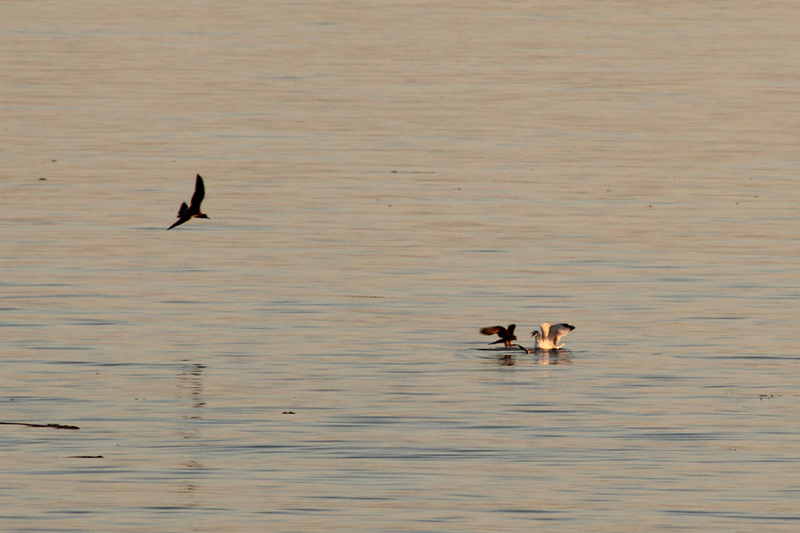 This time the phalarope was forced to hit the water to avoid getting wrapped up in the Peregrine's talons. The falcon then tightened the turnarounds, which forced the phalarope to have to continually dive under the water to avoid being plucked off the surface. Every pass the falcon made, the phalarope would dive under the water with a split second to spare. Several times the Peregrine even momentarily stuttered its pace in hopes that the phalarope would pop up. The repeated aggressive attempts to catch the phalarope eventually drew the attention of a juvenile Glaucous-winged Gull. 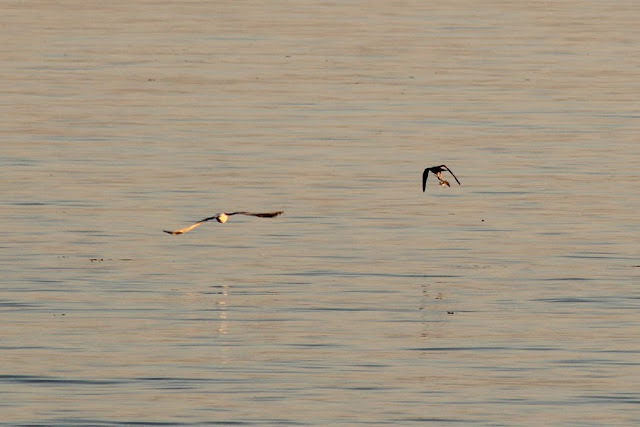 The Peregrine continued to pursue the phalarope while minimizing harassment from the young gull. The young Glaucous-winged eventually dropped the chase and an adult California Gull entered the scene with some raucous calling as it chased the Peregrine. Even in the midst of being chased by the adult gull, the Peregrine finally managed to time its attempt perfectly and it snapped the phalarope off the water. The Peregrine was unable to hang on to the phalarope as the California Gull mobbed it. The gull quickly descended on to the area where the phalarope was dropped in the water, but the Peregrine was not about to give up the meal it had worked so hard to catch. I'm sure the gull probably had no idea what to do with the phalarope because it was immediately on top of the poor bird. 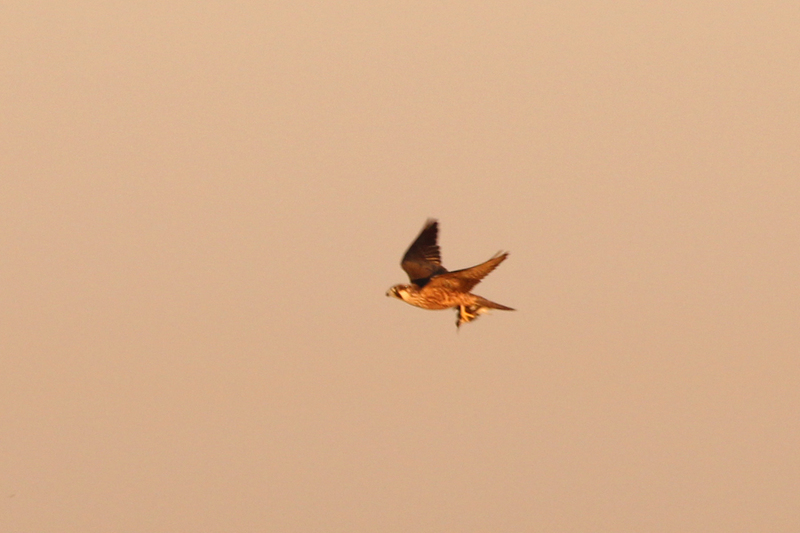 The Peregrine quickly circled back and reacquired its hard-earned meal. The Peregrine proceeded to fly towards me with the phalarope now tightly secured in its talons. 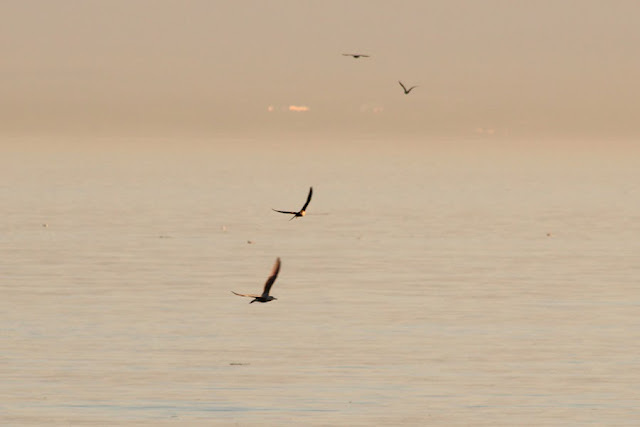 I was watching the from the east-facing side of Harling Point and the bird flew out of view up the tiny bay just to the north. Unfortunately, I didn't realize the Peregrine seemingly decided to land on the rocks just around the corner to north of me. I am not entirely sure where it landed, but a few minutes after it initially passed by, I saw it flying back out to over the water with the phalarope. Presumably, the falcon was headed to Trial Island to eat its well-deserved meal without disturbance.